Solvang resident James Sparks learned to bake bread from the best: his mother, Kaye. “I assisted my mother at her bakery in Idaho where I grew up. I was probably about 12 or 14 years old, maybe younger. We had milk cows and a bakery because I grew up on a farm,” Sparks told the Sun in a recent interview. But bread isn’t the only thing Sparks knows how to make. For his day job, Sparks is the assistant winemaker at Dragonette Cellars in Buellton. The day the Sun showed up to talk to Sparks about his new baking venture, he and the other Dragonette employees were “waxing” the bottles (putting the wax seals on the corks). “I have to be creative, and I have to be creating,” Sparks said. That’s why, in addition to making wine, he’s started baking and selling bread products—including bagels, loaves, and more—out of his home kitchen. 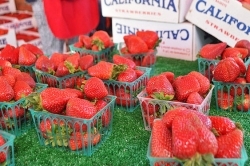 Enacted on Jan. 1 of this year, the Cottage Foods Act allows Californians to prepare and package select commercial food products in their homes. Sparks launched his “cottage food” business—Another Bread Company, A Sparks Brothers Bakery—earlier this month. The one-man baking operation currently offers handmade, artisan loaves and New York-style bagels to Santa Ynez Valley residents and visitors. Bread connoisseurs can pre-order items for either delivery or pick-up, and there’s also a monthly bread club subscription service. Sparks said he eventually plans to add other baked goods to his repertoire, but right now, he’s sticking with the basics. He uses a bread base, or starter, of 50 percent white and 50 percent whole-wheat organic flour, fresh water, and wild yeast from the surrounding air. After giving the starter time to grow, Sparks adds in more flour and water and a pinch of salt. If he’s making a specialty loaf, he adds a few simple ingredients, such as rosemary, thyme, or local olives. Then he lets the dough set for several hours before putting it in the oven to bake. “I’m basically creating bread that I love to eat on a regular basis,” Sparks said, adding that his favorite bread to make and eat is the country loaf. Naturally, those flavors complement the flavors of wine, so Sparks has been offering his bread to visitors of the Dragonette tasting room. If everything goes according to plan, Sparks said he’d like to find a commercial kitchen with an oven that’s big and hot enough to bake more complicated breads, like croissants, pastries, and baguettes. Those who would like to sample Sparks’ baked goods can place orders for loaves and bagels through the Another Bread Company website, anotherbreadcompany.com. People living outside of the Santa Ynez Valley can make inquiries by calling 1-877-327-2656 or by e-mailing info@anotherbreadcompany.com. Managing Editor Amy Asman wrote this week’s Biz Spotlight. Information should be sent to the Sun via fax, e-mail, or mail.